Monitoring is critical to any IT organization and most organizations have advanced monitoring of their core IT infrastructure. While this is important, the need to bring monitoring closer to the end-user is becoming of greater importance. 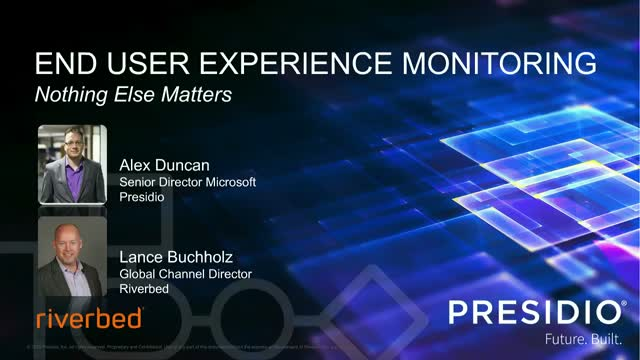 With the proliferation of SaaS applications and more complex integrations of applications and datasets, end-user experience monitoring will help close the visibility gap to IT organizations, reducing help desk calls and increasing productivity. Riverbed’s SteelCentral Aternity tool can assist organizations with making this vision a reality. Join Presidio and Avigilon for a webinar on Tuesday May 7th, at 10:30AM EST to learn more about what the next generation of AI and Analytics looks like, and what it could mean for your business. Reach a new level of surveillance and find what you’re looking for faster. Register now to be a part of the conversation! Microsoft protects your data in Office 365 from data center outages, but when data is compromised or accidentally deleted and needs restoration, other tools are required. Many of our O365 customers are finding significant benefits of utilizing Veeam Backup for Office 365. Something BIG will be announced in early April that is poised to be revolutionary in data center technology. Join Presidio and Intel on April 4th for more details about this major announcement. Cisco’s New UCS 480 ML Platform and Architectures for AI and Machine Learning. We’ll wrap things up at the end of the training with Q&A. Catch the On-Demand presentation with Presidio and Verkada to learn more about hybrid cloud security, and what your organization can do to adopt a Modern Surveillance Architecture. Hybrid Cloud brings compelling advantages to most businesses, but the journey can be challenging and confusing. Presidio has extensive experience designing and maintaining Hybrid environments, allowing us to facilitate any stage of your digital transformation journey. NetApp Cloud Volumes is a powerful cloud native solution that can help accelerate and ease the cloud transition. Please join us to understand how the Presidio and NetApp partnership will allow you to take full advantage of your Hybrid Cloud environment. owners are responsible for the security of their applications and data. and performance of your applications. while minimizing risk and business impact. Join our team of experts On-Demand as they host an Intro on Catalyst 9800 Wireless Controllers, and then dive into all things DNA Assurance. Presidio helps global organizations address various procurement, logistics and service issues by providing innovative, practical solutions, efficiency, control, risk mitigation, and visibility, all supported via our global team and expertise. We have a dedicated team of global commerce and logistics professionals available to assist with any unforeseen roadblocks or challenges. Presidio Illuminates the customer software journey by focusing on the customer experience and intended digital transformation outcomes. Focusing on the election cybersecurity challenges and how Presidio's cybersecurity team can help. During this session, we will discuss today’s cloud attack vectors and the potential impact there could be on your organization’s data. -How are these attack vectors exploited by an adversary? -What can you do to prevent these types of attack? -How are cloud security controls maturing to address these concerns? We will discuss what security controls can be put in place to reduce the attack vectors surface and minimize the risk to your organization. Many hybrid cloud technologies are designed to allow different private cloud and public cloud technologies communicate with each other, while leaving the actual workloads in proprietary formats that are not portable. With Hybrid Cloud offerings like VMware Cloud on AWS, existing VMware environments can be extended to the cloud and create a truly hybrid model that allows workloads to easily move to where the business needs them. Mark Vaughn, Director of the Strategic Technology group at Presidio, will share his insights and expertise during this engaging talk. Join Presidio and Amazon Web Services for this informational webinar on how to kick-start your journey to the cloud. Companies are under increasing pressure to deliver Cloud transformation results quickly. Setting yourself up for success should not stop you from getting going, and understanding best practices saves time and money. Hear from speaker Tim Harney and Mark Grigoletto on how to simply and effectively begin your Companies journey to the Cloud – and more importantly, why this should be a priority! Here is the August Tech Talk Video, " Cisco Identity Based Web Policy"
In this upcoming webinar you will learn how VMware Cloud on AWS can help your organization simplify operations in a hybrid cloud environment. VMware Cloud on AWS seamlessly integrates VMware compute, storage, and network virtualization capabilities with the full breadth and depth of services and global infrastructure footprint of AWS. This offering enables your organization to seamlessly migrate and extend your on-premises VMware vSphere-based environments to AWS, so you can realize the value of a hybrid cloud environment. Amid the many challenges of compliance, security, big data and doing more with less, healthcare organizations face many questions. How can they keep critical operations secure and efficient? And how can they adopt a solution as swiftly as possible, often across multiple departments and work sites? For healthcare organizations, these questions are just one piece of a puzzle that involves integration, patient experience, security, and more. Mergers, acquisitions, and geographic expansion challenge healthcare organizations to bring together multiple networks, IT infrastructures, and call centers — while maintaining quality and consistency in care. With all of these pressing priorities, where can you invest for the most bang for your buck, today and tomorrow? 66% of healthcare professionals use at least 3 screens –tablets, smartphones and desktops. Nurses, physicians, pharmacists, insurance providers, and other HCPs need real-time information at their fingertips, delivered from a system that’s shared rather than segmented across silos. With the right technology and strategy, healthcare organizations can stay compliant and connected — with minimal havoc. Register for this webinar today! Check out our April Tech Talk session, "Working with the Cisco Meraki API”, presented by Thomas Polcaro, Presidio’s Principal Data Center Network Engineer. Presidio is a leading IT solutions provider assisting clients in harnessing technology innovation and simplifying IT complexity to digitally transform their businesses and drive return on IT investment. Our Digital Infrastructure, Cloud and Security solutions enable our almost 7,000 middle market, enterprise and government clients to take advantage of new digital revenue streams, omnichannel customer experience models, and the rich data insights generated by those interactions. Our mission is to enable our clients to capture economic value from the digital transformation of their businesses by developing, implementing and managing world class, cloud ready, secure and agile IT Infrastructure solutions. We deliver this technology expertise through a full life cycle model of professional, managed, and support services including strategy, consulting, implementation and design. By investing in the future of IT solutions we stay at the forefront of technology trends. And to ensure our clients have access to a wide range of technologies and best-of-breed solutions, we partner with over 500 OEMs including market leaders and emerging providers to bring our clients integrated, multi technology solutions.